How To Do Extension Work and Organize a New Praesidium. The information in this provisional draft is taken from various Legion sources and from five decades of experience. q Speak in a clear voice so all can hear. Allow only one person at a time to speak. q "Oversee" the other officers in the performance of their duties. Time spent, number of homes visited, number of "contacts," amount of literature and distributed, any positive results, name and addresses for call backs. Also if you recruit any auxiliaries give the 3 x 5 card to the vice-president with the names, addresses, phone numbers, date contacted and legionary who contacted them. q YOU assign the works to be done in pairs at the end of the meeting. Assigned work is not left for the members to pick and choose or to the spiritual director. q Say Frank Duff prayer for the spread of the Legion of Mary and recruitment of new members. q Be sure cabinet and room are secure. q Keep in touch with the members and spiritual director to coordinate works. q Once a month put a paragraph in the bulletin to recruit new members. q For door-to-door visits keep a map and mark streets covered. q Keep in touch with the curia. Attend the meetings monthly. Send a donation monthly to the curia. As we meditate on the mysteries in Christ's life recall our union with Mary. She will perfect our prayers and meditations and offer them to God for us. 1. Who are the principle persons in this mystery? 2. Why do those persons speak and act as they do? 3. What does the mystery teach me? We hope you find this helpful. Keep in mind this is unofficial and must be adapted for specific locations and conditions. Submit any corrections or suggestions for changes or additions to Brother Charles. I. So, the curia gave you and extension assignment! What do you do now? A. You should begin by getting together extension material. Look over all the active and auxiliary membership leaflets. Check the forms section of our website. Pick out some appropriate material and study it well. You need to study like it was a school homework assignment. B. Do you have any material especially appropriate for a priest, such as "The Priest and the Legion"? Or articles from magazines? A letter of introduction? A copy of the Bishop's letter. II. How do you contact the pastor? A. Your first job is to get an appointment. The Legion used to believe in "cold calls" where two members would visit unannounced. In this day in age, with our busy priests, that is not usually a good idea. B. Call and make an appointment. Your next job is to get past the parish secretary. Some rectory workers think their job description is to try to keep as many people as possible from seeing their boss. C. Tell whomever you talk with you want to discuss an important matter with the pastor and would prefer to speak only with the pastor - not a secretary and not an assistant. 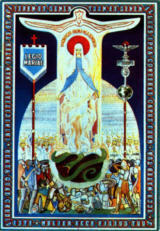 It is better not to mention the Legion of Mary, but you may say "an organization I belong to. D. Try to schedule a half-hour appointment. You must be flexible; make your visit accommodate the time the pastor has available. E. Do not visit alone! Experienced extension workers should take along a new member to train. Sometimes a new member has a new type of approach. III. He said, "No," so that's that, right? -- No! B. It is a good idea to study the section of the Handbook, "Objections Which May Be Anticipated." Again, do not argue! Agree with everything you possibly can. C. A good tactic is to "play back" what the priest said. "I understand you do not have an assistant, and feel the Legion would just be an added burden; is this correct? Maybe we can help"
D. Above all, try to let the door open for a return visit in three months, six months, or a year. IV. He said, "Yes." What do I do now? A. Don't do what one group did: Run right back to the curia with the good news, but without any follow-up. B. Determine the method or methods of recruiting members he wants to use - hand pick, form a cadre, or the Invitation/Columban recruitment method. C. If he wants a recruitment drive, try to pick a day. Accept the date he thinks is best. D Pick a firm time, place, and date for the first meeting. It should follow as soon after the invitation drive as possible; for example, Monday evening. You have a firm date and place for the first meeting. The fact that the Legion will be recruiting will be announced in the bulletin for at least two weeks. The pastor will be present and knows exactly what to expect. You have contact cards to get names of prospects. E. Try to get a feel for the kinds of works he wants his praesidium to do. Bishop Victor Galeone specifically mentioned evangelization and contacting inactive Catholics. Bases on private messages, we know Bishop Estévez agrees. V. What are the methods for recruiting members? 2. One or more invitation drives (Columban Drives). 4. The pastor speaks at all the Masses. 5. A Legionary speaks before all the Masses. B. What method is best? It very much depends on the parish and the pastor. Usually a combination of two or more is best. Each method has it advantages and disadvantages. VI. What is an Invitation/Columban drive? A. The first Columban drives were held in England by the Columban Fathers, thus the name. They have been used throughout the world. B. A priest speaks at all the Masses about the Legion. It is best if he can work some mention of it into his homily. - a half hour before and a half hour after - to contact as many as possible. The more contacts the more prospective members. F. The era we live in is a time when circumstances may prevent completion of the Columban drive exactly as described above. Be aware that any variation will mean less prospective members. However we must work with what is available to us. Reconnoiter the church. How many exits must you cover? How many attend each Mass? How much material do you need? Where will you place the Legion Alter? Are there tables to place our literature on and write on? Who will speak at each Mass? It is best if the priest does and can work some mention of the Legion into his homily. Otherwise and experienced Legionary may speak before or after the Mass. VII. How do you set up the first meeting? A. Ideally it should be Monday evening. However, in some parishes that is not practical. You may find a Saturday morning meeting is better because both working people and non-working people can attend. It should be as soon after the drive as possible. VIII. What do you do at the first meeting? A. The biggest mistake for first meetings is trying to tell too much. They have a lifetime to learn about the Legion of Mary. Tell only what is absolutely necessary. B. Give those attending a very brief history of the Legion of Mary. They are not really interested in history at this point. D. Conduct it as if it were an actual meeting - which it is. Begin with the prayers, spiritual reading, have sample minutes ready, take roll…. E. Read the Standing Instructions and briefly outline what they mean. You can go into details at later meetings. F. Do not put a lot of emphasis on weekly meetings. At this point we are only interested in getting them understand the need for the Legion and to come back next week - not for the rest of their lives. (That comes later.) Also DO NOT speak about auxiliary membership. H. Allow for questions and brief answers. J. Then ask each person if he will come back next week at the same time for more information. K. Assign each person to try to enlist one person to come with him next week. L. Say the closing prayers and the Frank Duff prayer for the success of the Legion in the parish. M. Keep the meeting lively and moving. Limit it to about 75 minutes. Many meetings follow to discuss details. IX. What do you do at the next meeting? B. Appoint acting officers. Stress they are acting for this week's meeting only. C. Distribute Handbooks (at second not first meeting) and get names of those who take them. (Tell them the cost - which can be paid later.). D. Expand on the standing instructions. E. Ask for reports on the recruiting efforts. F. Begin to briefly discuss auxiliary membership. H. If there are experienced Legionaries available, give them assignments to complete. J. You MUST continue meeting with the new group every week for months until officers are appointed and trained. Then wean them away. X. In subsequent years, as the praesidium gives report after report, remember that your efforts and those of your brothers and sisters helped Our Lady to get the results she wanted for her Son. 1. So, you completed the curia's extension assignment; an invitation drive was held; names were collected at the drive; the first meeting has been announced, what do you do now? Sit down with the pastor/spiritual director and explain his role. Determine what works will be undertaken and when. Try to get a commitment for him to attend at least one meeting a month. Be sure he is present when you do your recruitment drive and supports you with his homily or remarks. v The excerpts from Blessed John-Paul II show great insight into the Legion and cover the basics. It is found near the front of the Handbook along with quotes from other popes. v Chapters 1 and 2 of the Handbook. v If the spiritual director is present, a good reading is "The Priest and the Legion," Chapter 10 #4.
v Or the first part of Chapter 5, "The Devotional Outlook of the Legion." 2. Get ready for the first meeting. Various councils have different ways of affiliating a praesidium. The Miami Regia and some other councils maintain that the first meeting of the praesidium at which Members of the governing council are present is the official date. Therefore, for most intents and purposes this first meeting is the founding date of the praesidium. It is meeting No. 1. So it must be done correctly, as much like a regular meeting as possible. You represent the Legion of Mary. Review Handbook Chapter 19, "The Meeting and the Member" Especially take note of No, 3 through No, 7. Study the meeting place, and plan the setting to be as appropriate as possible. The Legion of Mary praesidium is like a family with Mary as its mother. The setting should be as home-like as possible with the members gathered around a table, the altar representing our mother. There should be no hint of a school atmosphere. A. Pass out Rosaries and Tesserae. B. Say, "Every Legion of Mary meeting since the very first one has begun with the Invocation of the Holy Spirit and five decades of the Rosary. I will lead the first, third and fifth decades, and you will respond. You will lead the second and fourth decades and I will respond. Don't worry if you mess up - even experienced Legionaries do some- times. These prayers are normally said kneeling, but many of us cannot, so it is OK to sit." C. After the prayers, pass out Handbooks. It is OK if some have to share. Say: "The Legion of Mary Handbook costs us $__.___ (price varies; check current price with treasurer.) It is the only thing we will ask you to pay for. I will collect the Handbooks after the meeting unless someone wishes to buy one today." E. Minutes - prepare sample minutes telling works being done in the area and have one of the experienced Legionaries act as secretary. Show them the secretary worksheet. F. Standing Instructions - read and explain VERY briefly. G. Roll Call - Pass around a form for them to write their name, address, phone number and e-mail. H. Treasurer's Report - Have an experienced Legionary explain the secret bag. Explain what the curia is giving to them to get them started and reasons why it is necessary to contribute to the higher council. K. Discussion of Handbook. Allow for questions. (No more than 10 minutes.) Show the president's worksheet and explain that this is the agenda for every meeting. M. Give each one material to recruit active members - do not talk about auxiliaries yet - assign them to contact at least one other person and bring them next week. If you have names of prospects that are not present, you may assign them to be contacted. N. Keep within the 90 minute time limit. Say: "After the closing prayers we will be available to answer questions." O. Closing prayers and Frank Duff prayer. 5. Taking the promises and taking your leave. Gradually start to wean the group away from your interventions. Go every other week for a time, and then go back after a month for a final check and answer questions. Encourage them to learn and grow by keeping close to the governing council. After 12 weeks the members should start taking their promises one or two at each meeting, and always individually so each can hold the Vexilium. Make the promise taking an event. Follow directions in the Handbook. Recommend officers to the curia. (Remind the new praesidium they do not vote on officers, the council appoints them.) When at least two officers are officially appointed by the council, fill out the affiliation form which the council must approve. Visit the praesidium in about six weeks after they are affiliate to tie up any loose ends. (This can be an official council visit)4. Follow the same format for the second through the sixth meeting. A. At the third meeting introduce the idea of auxiliaries - how they are recruited, cared for, and how important they are. Auxiliary membership should not be regarded as an "easy out" from our apostolic obligation. B. Throughout this period be on the lookout for prospective officers. C. Invite a member to sit beside each of the experienced Legionaries and see how they do their officer jobs. D. About the fourth time (or when ready) have a member of the new group take over each office. An experienced Legionary may advise. E. By the fifth or sixth meeting the group should have their apostolic action in full swing. You may need to accompany them at first on more difficult tasks. F. After about the sixth meeting you can cut back the number of Legionaries you assign to attend the new praesidium. It is desirable to rotate the training duties among Legionaries. This way the new praesidium gets to meet more members and newer members gain experience in training. G. Explain that officers will be appointed by the curia after they have taken their promise. Explain the promise. H. Explain the curia and invite members to attend meetings and functions. I. Continue to stress the importance of the weekly meeting and that the praesidium must never skip a meeting. The may change the day, time or place, but they must hold a meeting every week, even if only one or two members are present! and tips for a great meeting. Handbook Discussion (suggest starting with Chapter 39 - one member should be assigned to lead the discussion. Assignments for the coming week. q Get flowers and set up room for meeting. q Prepare allocutio if SD cannot be present. q If you cannot be present, be sure another member (vice-president or acting VP) has the workbook and is prepared to take over. Must be prepared by the partners in advance from their notebooks, (every members should have one) and should be about two minutes in length. Each should have a notebook. Good legionaries take care in preparing and giving reports. Make them personal, vivid, distinctive and interesting. Don't use routine phrases. Report only work that was assigned by the praesidium (president).